Like neighbours City the original badge was a variation of the city arms and as some elements still remain on the football badge its well worth going through how the Coat of Arms was built up. 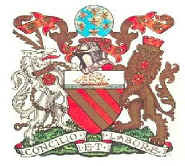 The 3 golden diagonal stripes on the red shield are taken from the arms of the Lords of Manchester. Sitting on the top of this shield is a ship, this is thought to signify the canal network which was used significantly in trade and industry in the good old days !! Sitting on the top of all this is a globe covered in bee’s, again this is thought to be a symbol of Manchesters global trading links – it is well known that in heraldry terms bees represent activity. The antelope and lion which support the shield are derived from the arms of King Henry IV, Duke of Lancaster. Of course the Red Rose of Lancashire has to be represented and so it is on both of these animals. Finally the motto “CONCILIO ET LABORE” translates to “BY COUNSEL AND WORK”. Following problems with counterfeit goods they changed the design as they couldn’t copyright a Coat of Arms, however I’m not exactly sure when this happened but I have found an example of the new football badge in the 1958 Encyclopedia of Sport. As you can see the new badge retained the gold bands, the ship and the Lancashire Roses but dropped everything else. At some point between 1958 and the early 70’s they also dropped the gold bands and replaced them with a Devil, this was thought to be on the request of Sir Matt Busby who had heard the nickname Red Devils being used for local Rugby team Salford. Below is an example of the football badge as portrayed in the Esso collection of football badges that was released in the early 70’s. 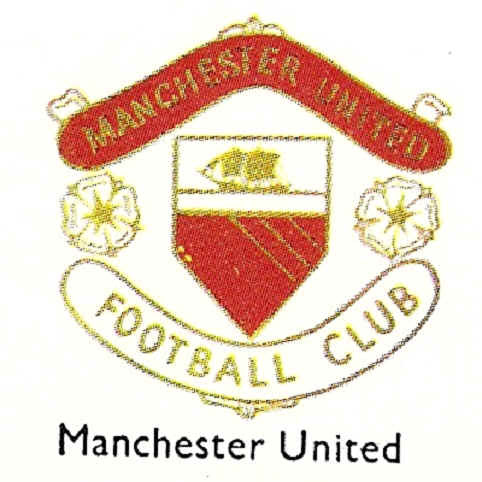 At some point during the 70’s they then replaced the Roses with footballs and the badge remained that way till 1998. I have heard that the badge was changed slightly during the 1980s when Adidas sponsored the team and apparently a pair of boots were added to the ribbons on the badge, I haven’t been able to find any examples of this though so don’t know for sure if that is true. 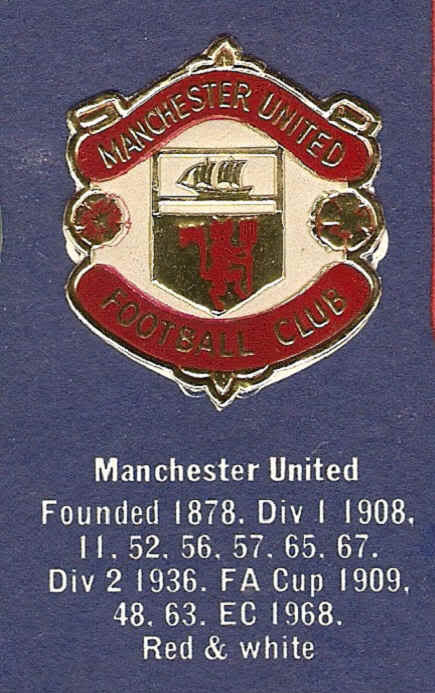 Anyway, in 1998 the badge as we know it now was introduced and the only major change was the dropping of the “Football Club” from the scrolls. 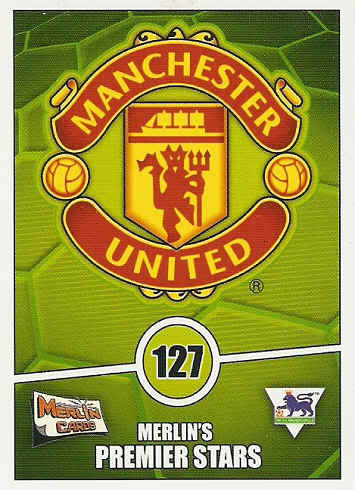 Please note that in order to ensure we don’t fall foul of copyright laws by inadvertently showing an unofficial picture of the new design we have scanned in one of our own collection of Merlin trading cards that does show the new football badge in all its glory.